This post is sponsored by Pinnacle and the BlogPaws Professional Pet Blogger Network. 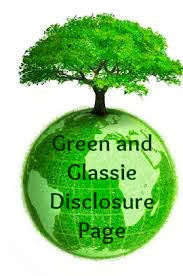 I am being compensated for helping spread the word about Pinnacle’s reformulated Grain Free Dog Food but Green and Glassie only shares information we feel is relevant to our readers. Pinnacle is not responsible for the content of this article. Making sure that Diesel is healthy and active is so very important to me. Diesel is my partner in crime...we are a Team. When I was asked to test Pinnacle® Pet Foods. I was impressed with the Pinnacle's quality vision ~ Make quality dog food with the highest quality natural ingredients and continue to strive to make their dog food healthier. Explaining their decision to go Grain Free in May of 2015. 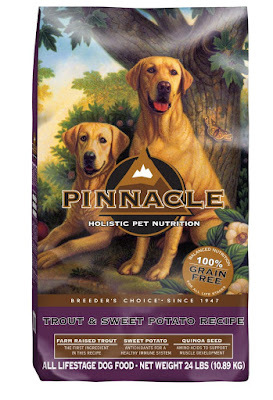 Pinnacle for your dogs total nutrition he needs for holistic health. Grain Free, limited ingredients and made in their California plant. Pinnacle holistic dog food delivers tasty good food which is also good for dogs with sensitive stomachs. After a month of eating Pinnacle I am happy to say that Diesel loves it! I am also happy ~ I have noticed positive changes in Diesel's bowel system. He is very regular and his stools are smaller. He is also very satisfied after mealtime. Making for a healthy happy pup. I was so impressed with Pinnacle that I purchased a bag of Pinnacle to take with Diesel and I when we went to Dawn's house to watch the kids and Digger while her and Dave took a get-a-way trip to Florida. Digger is also now a fan of Pinnacle. 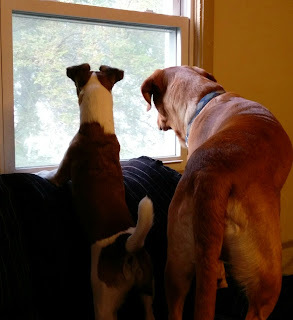 Check out this pic of Digger and Diesel watching the kids get on the school bus. Watching Isa and Davey get on the school bus each morning is their job. Gosh you can see the love in their eyes while they keep watch over the kids. The pic of the Digger & Disel kissing I think is adorable. When Dawn seen these pics the first thing out of her mouth was "Mom, do you let Diesel walk on my tables while you are here by yourself?" Shocked!!! I said "Who me?" She gave me her best Mom look and we laughed! 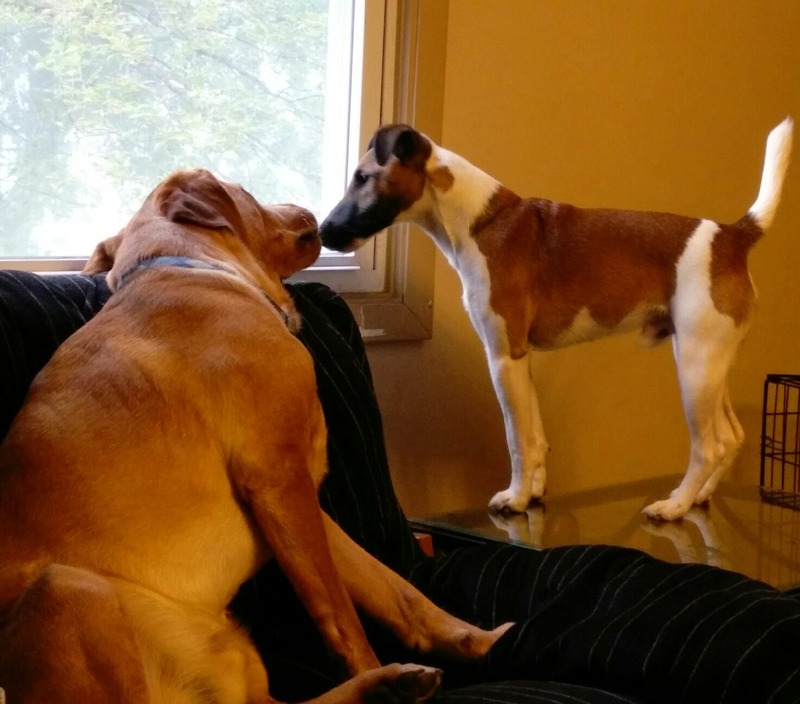 Digger and Diesel are full of so much love. Two of my bestest buddies are definitely worth the best food I can find. Pinnacle is the brand for us. Natural quality ingredients to ensure total nutrition health made in the USA. This sounds like a great brand of dog food. I would definitely consider it for my dog. It's so true how our furry family members are devoted to the two-leggeds! I love the photo of them watching the kids get on the bus. lol I'll have to look into Pinnacle as an option for our dog. There is too much cuteness happening here. They definitely looking happy and healthy with their food. Aw! The kiss is so cute! Cutie dogs. We need a new brand of dog food - we are not locked onto the one we use now. Sounds like a great quality pet food. Will share with my dog owner friends! My dogs are doing really well on their food too! Your fur kids are cuties! I am always looking for the most nutritious food for my dog. I will look for this product when we need to buy more food. Pinnacle sounds like a great brand of dog food. Your dogs are so cute, I just want to squeeze them. Oh my goodness! They are so super cute. So cute they can get away with table-perching. Sounds like they are doing great on Pinnacle! Limited ingredients are really important for me when choosing pet food. Pinnacle sounds like a quality brand worth trying. Oh, I love the dogs kissing! They are so cute and definitely deserve a great food like this! I seen this dog food at the store the other day. Looks like a great brand. I think I'll have to give it a try next time I purchase dog food. This sounds like a really good dog food brand. I love your dogs' names, by the way! My dog eats Pinnacle during game play in his Nina Ottosson games and it is such a great food and healthy, too. Thanks for the info. It's so important to actually know what's in your dog's food. Aw that is a cute picture of them kissing. You got a great shot there! I've never heard of Pinnacle before now. I'll have to check that out for my own pets.